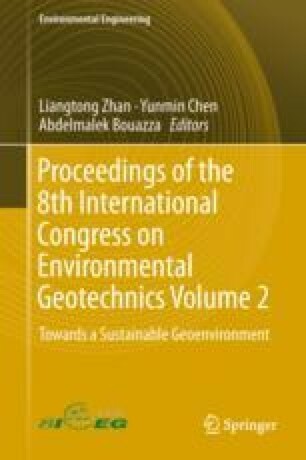 Considering exponential decreases in landfill gas (LFG) generation and gas permeability of waste with depth, a design method for vertical gas well spacing to achieve a 90% recovery rate is proposed through a quantitative analysis of over 500,000 scenarios calculated using a normalized analytical solution. Both increasing cover resistance and pump capacity can allow an increase in the well spacing while maintaining a 90% recovery rate but may result in a maximum gas pressure below the cover ranging from −5 kPa to tens of kPa. A balance between cover and pump effects is to be achieved in this paper by constraining a maximum gas pressure of 1 kPa below the cover and a recovery rate of 90%. With this goal, the design cover resistance is shown to be strongly related to LFG generation and vertical gas permeability at the top of the waste and the non-homogeneity of LFG generation with depth, but is independent of vacuum pressure and non-homogeneity of gas permeability with depth. A chart suitable for designing to meet these objectives is proposed and illustrated by a practical application.